The original hospital was a large family home located at 4th and Kennedy and donated by the Haskell family. The house was extensively remodeled with a $30,000 addition and opened in 1951 as Alma Memorial Hospital. The five patient rooms included three three-bed wards and two two-bed wards. The OB department had been located upstairs, with the labor room in what was once a closet and doors too narrow to accommodate a gurney. Despite the inconveniences, 1,051 babies were born in the 19 years the original facility was operated, and thousands of patients received professional care close to home. By the mid-1960s, however, the need for a larger, purpose-built facility to serve the healthcare needs of Harlan County was apparent, and a bond was passed by the citizens to build one. The cornerstone was laid on June 10, 1968, and the new building was dedicated in April of the following year, with all the amenities of a first class modern hospital. 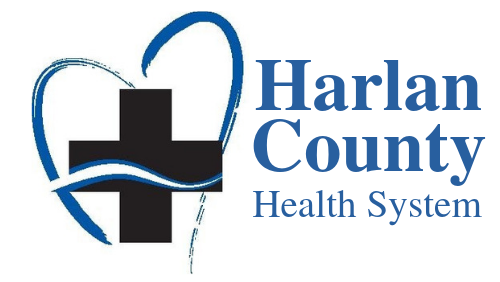 Harlan County Health System was designated as a Critical Access Hospital in 1999, the first in the area. In 2007, the hospital was extensively remodeled with a $6 million addition that virtually doubled the existing space and added state-of-the-art features to the ER, surgery, radiology and other departments. Among other improvements, the addition afforded a chapel for quiet reflection, an enclosed ambulance entrance, comfortable waiting rooms for the emergency department, surgery, and outpatient services, and a hospice room.